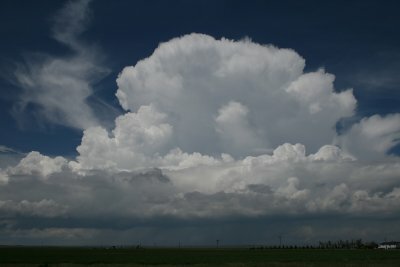 The Wheatland Storm from GO to WHOA!! After overnighting at Ogallala, we decided to head west for our target area of southeast Wyoming searching for clear sunwarmed areas. 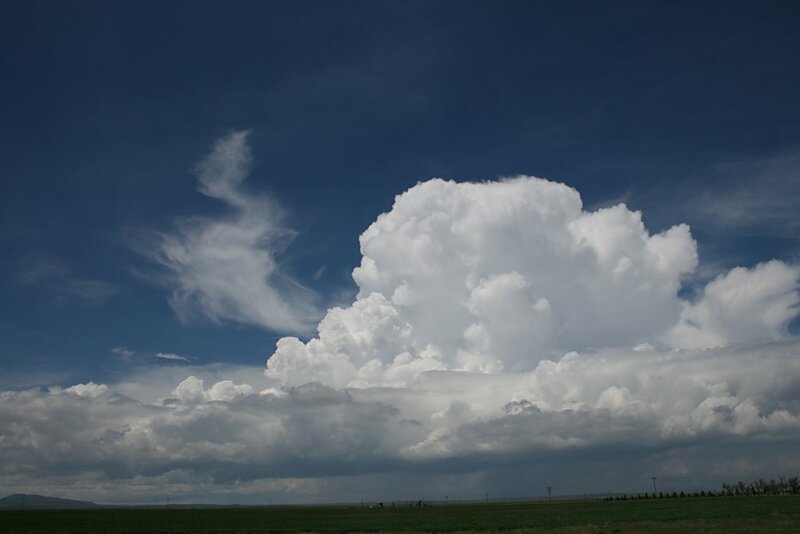 The synoptic setup showed a complex arrangement of a trough and a small vorticity max moving through eastern Wyoming / western Nebraska panhandle through the afternoon. 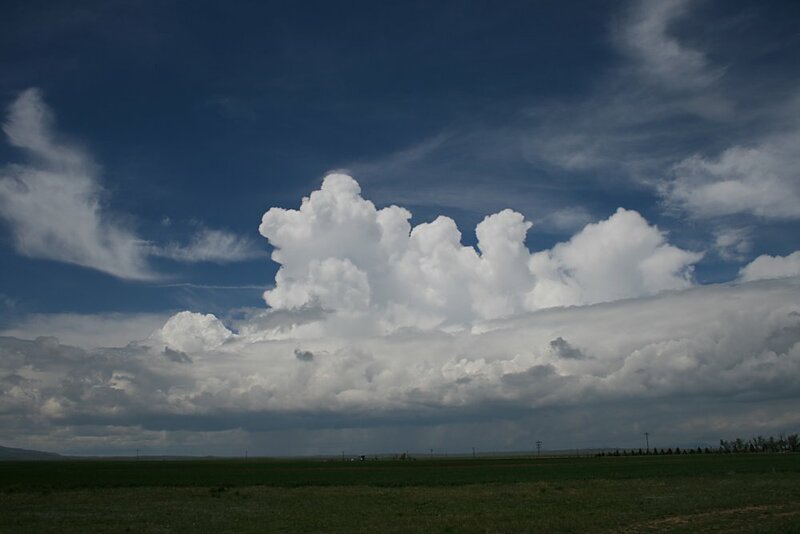 Approaching Wheatland from the south, we noted a dissipating multicell and just to its southwest an alignment of deep cumulus persisted and appeared to be generating lee of or near to high ground. We pulled over about 15 miles south of Wheatland and watched the Cu alignment throw up a tower to glaciate. 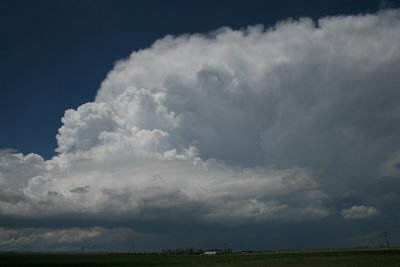 Sometimes you can be lucky and be in a position to study the evolution of a storm to start to finish. 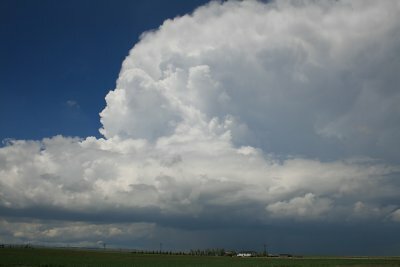 From the first narrow tower the alignment lingered, not doing much for 10 - 15 minutes...and then a larger updraft really got the storm going. At first it was a picturesque classic Cb with a flanking line...but we noticed as the storm shifted east-northeast, it was starting to draw a clear inflow of warm moist air from the south. 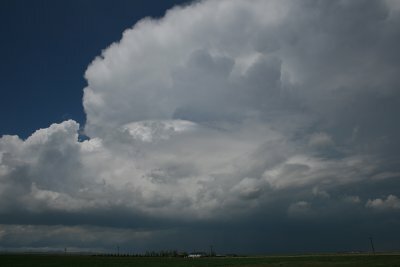 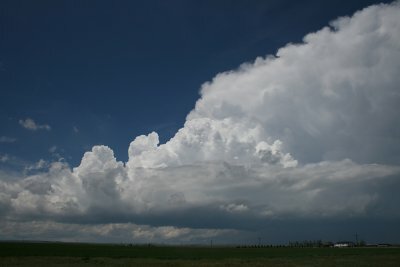 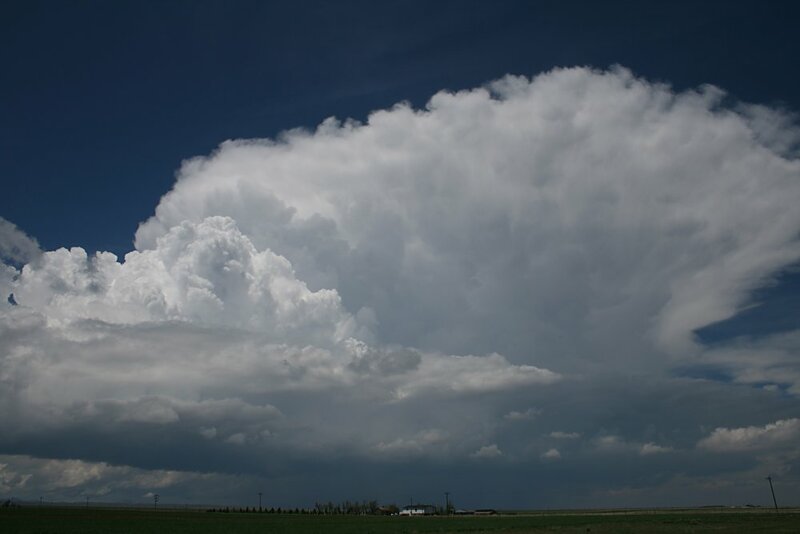 The area to the south of Wheatland was almost cloud free, and no doubt influenced the intensity of the storm as its flanking line dug into an increasingly better inflow. The storm continued to put up successive pulses which rapidly expanded its anvil. 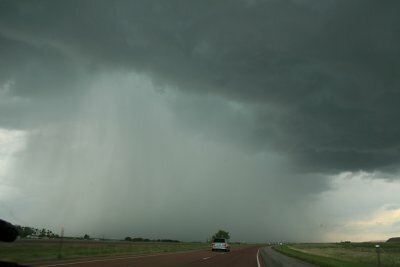 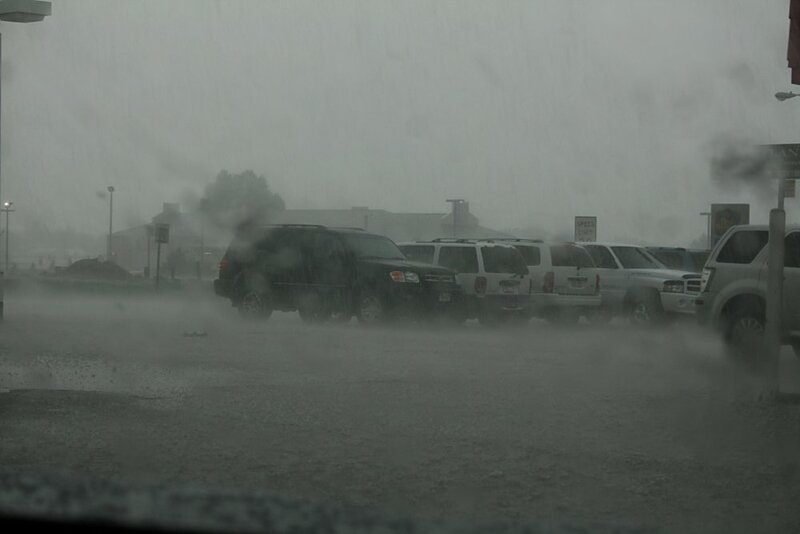 We moved north along I-25 and approached the Wheatland township..we struck a brief amount of large hail (finally got a dent in the bonnet!) 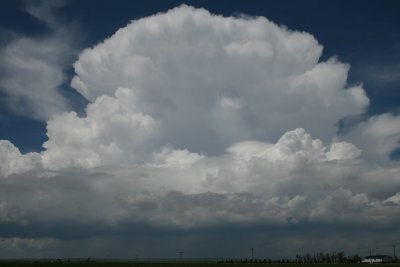 near the infeed edge of the storm...estimate size from 4 - 6cm (1.75 - 2.75"), however, most hail was pea to marble size. 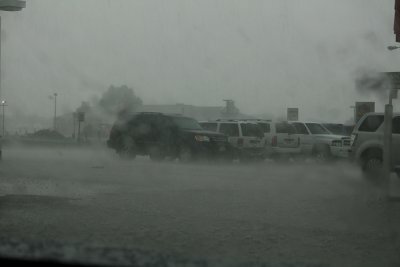 The sight that greeted us at Wheatland was virtually chaos...as the torrential hail and rain quickly flash flooded the town! The amount of precipitation would be difficult to estimate but would have been between 1 and 2" (25 - 50mm) falling within 30 minutes...virtually all streets became rivers. 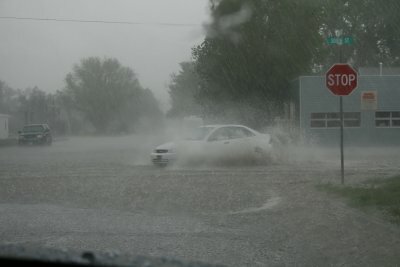 The water was washing hail into drifts along the front yards of houses, and at times, visibility was almost a whiteout. 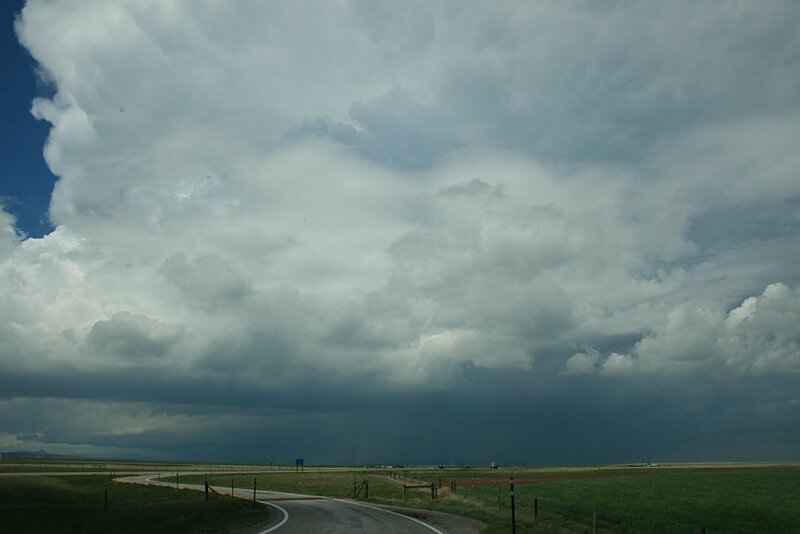 We escape north and watch the storm slowly weaken into a linear multicell.